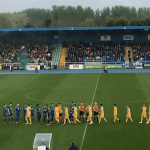 Waterford FC travelled to St. Colman’s Park on Sunday afternoon last to take on Cobh Ramblers in their second game of the season but they had to settle for a share of the spoils after a hard fought 1-1 draw. The pitch conditions was better then expecting considering the amount of rain fall over the previous days. Cobh started the better in what turned out to a scrappy half from the Blues point of view, a half in which the home side played the better football. The home side struck for the first goal on 16 minutes when Lee Kelly Obi took advantage of a mistake in the Blues defence before drilling a low shot past Cormac Rooney from six yards. The Blues made four changes at half time and in turn it had the desired effect as Derek O’Brien’s side took over the second half and kept the ball much better and dominated possession. The equaliser came 16 minutes into the second half where good build play from the blues found Scott Delahunty on the edge who’s shot was spilled by the keeper where good anticipation resulted with a tap in for Jake Doyle. Dean Larkin and Jamie Lee did have half chances with their attacks down the right and left channel while the home side were also dangerous on the break. The game was the definition of a game of two halves with the home side having the better of the first and the Blues taken over the second. 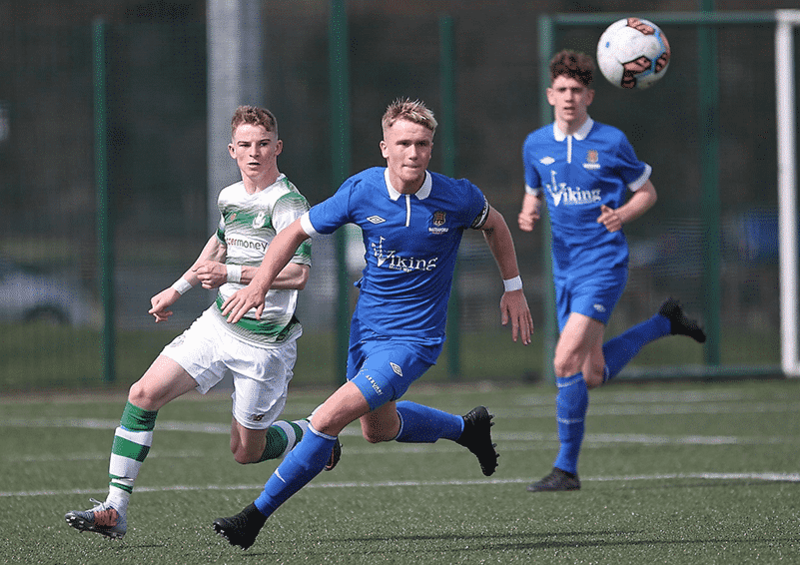 Waterford FC paid the price for two missed penalties as they lost out to Shamrock Rovers in their SSE Airtricity Under 17 Southern Division clash played at the WIT Arena on Saturday afternoon last. After Rovers struck the front in the game, the Blues missed a first penalty before levelling until Niall O’Keeffe missed a second penalty. Rovers struck the front with 12 minutes on the clock when Jack Kelly beat Blues keeper Ben Kirwan with an effort from the edge of the area as his right-footed shot found the bottom left-hand corner of the net with a stinging drive. Ciaran Brennan had a chance to level from the spot on 24 minutes when O’Keeffe’s delivery was handled in the area but the spot kick was blazed over the crossbar. Kelly struck the crossbar at the other end minutes later before the Blues levelled on the half hour mark through Alex Phelan who touched home a Brennan cross. A second Waterford penalty arrived shortly before the half time break when Brennan was brought to ground by Rovers defender Alex Dunne but Niall O’Keeffe’s shot came back off the left-hand post. The second half was one of limited chances with Kacper Zajac having Waterford’s best chance as his stunning effort came back off the bar. The winning goal for Shamrock Rovers came with 72 minutes when Dan Bogdanous raced onto a long ball from midfield that split the Waterford defence and the attacker held his nerve to drill a low left-footed shot beyond the reach of Ben Kirwan as the Blues suffered their first home defeat of the season. Possession was shared early on, but the blues soon got into their grove, with Jack Larkin going closest when his close-range effort cleared the bar, following a good move down the left-hand side. 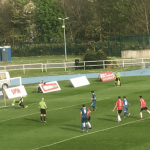 Waterford finally broke the deadlock on the half hour mark, when Colm Whelan’s endeavour allowed him to capitalise on a mistake by the Cork City goalkeeper, before tapping into an empty net. The game changed on the stroke of half time however, when Waterford midfielder Shane Griffin received his marching orders for a second bookable offence. Waterford shuffled the pack, with Jack O’Donnell replacing first team regular, John Martin, at the interval. It was backs to the wall in the second-half performance from the 10-man blues didn’t stop the entertainment, with Cork dominant in possession and Waterford organised and looking to counter. The Blues had two good chances to double their lead, but efforts from Whelan and Adam Conway were denied. Goalkeeper Paul Martin at the other end made some vital stops which saw the home team eventually secure all three points.